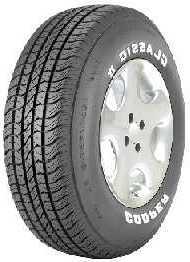 The Classic II is Cooper's first line all season touring tire designed for customer's looking for the solid raised white letter look in the P235/75R15XL size. The extra load capacity makes it especially suited for older SUVs, light trucks and full size vans that use 15" wheels. "See through" grooves and wide, lateral traction slots carve out a modern 5 rib tread design to provide excellent all season performance. Elongated siping in the shoulder elements enhances the tire's gripping ability in diverse weather conditions. A specially formulated tread compound helps provide a combination of long, even treadwear and excellent traction. This tire rates an A for traction in UTQG grading.